Easily elevate your everyday cup of coffee. 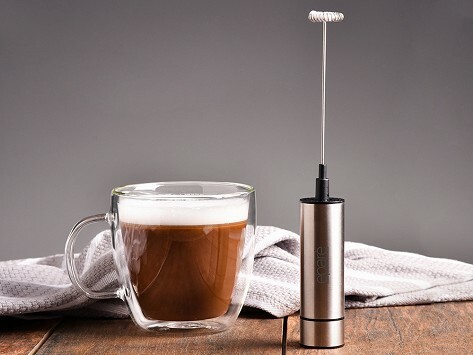 This frother quickly whips up milk or cream to make a latte or to top off your morning joe. You can also use it to make whipped cream, milkshakes and more. The whisk pops off from the battery-powered base and can go through the dishwasher for clean-up. Dimensions: 9.25" x 1.25" x 1.25"
It’s compact and easy to use, cleans up easily, works like a champ. easy 2 operate and adjust so you can set it for whatever size grounds you want.